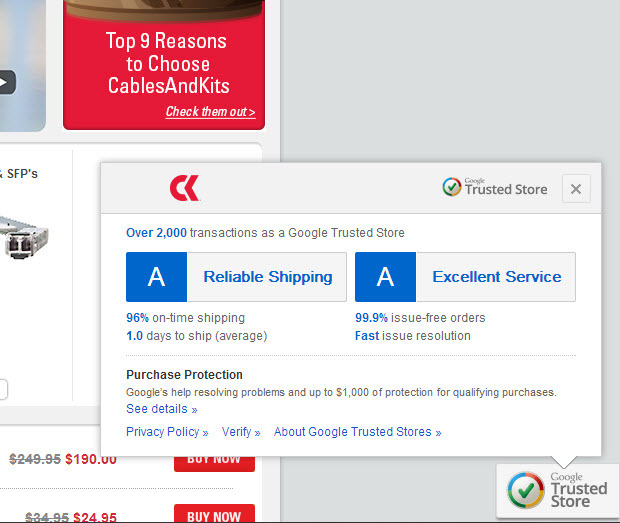 As a Google Trusted Store, CablesAndKits customers now have the option to select free purchase protection from Google. Then, if a problem arises with their purchase, customers can request Google’s help, and Google will work with the merchant and customer to address the issue. Google stands behind merchants that have earned the Google Trusted Stores badge with a $1,000 lifetime purchase protection guarantee per shopper. When visiting a qualifying store such as CablesAndKits, shoppers can hover over the Google Trusted Store badge and see metrics on the store’s shipping and customer service performance. Plus, being a Google Trusted Store is entirely free, both for shoppers and the online stores. CablesAndKits has always operated under simple core values. They believe in doing the right thing, serving others, raising the bar, and balancing life while enjoying the journey. These philosophies have helped the company establish their brand and maintain a commitment to what is most important, being recognized as a trusted source of quality Cisco equipment, Ethernet cables and other accessories. The Google Trusted Stores badge only further confirms that CablesAndKits is on the right track.